Finally we arrived at Fedora Meetup #2, and brought together in one place people who share the same love about Fedora and others who are interested in getting to know more about this Linux distribution. The event took place at Protik ICT Center, on 15th July at 5PM. One of the main reasons of this meetup was the new Fedora release. At the meetup we got to show people the easiest way to upgrade to Fedora 22 using a tool called FedUp and also talking a bit of what’s new on Fedora 22 workstation, like the notifications that are displayed in the center of the top bar to keep us better informed and interfere less with our work, theme and interaction enhancements, scrollbars, the software application from which it’s easier to find a wide variety of useful free software, improved file browsing with files, image viewer, virtualization with boxes, builder that is a new IDE for GNOME that contains a wide range of features, and of course the migration from yum to dnf. How to contribute at Fedora? I explained different ways how to do this, mainly I was focused at localization because it’s very important for our community to have Fedora in Albanian language so we can bring everything around Fedora closer to our community. Bela presented to us some of the LibreOffice localization experience of LibreOffice community in Albania and how is it related with Fedora. We also took a look at the Fedora wiki which needs to be translated in our language. 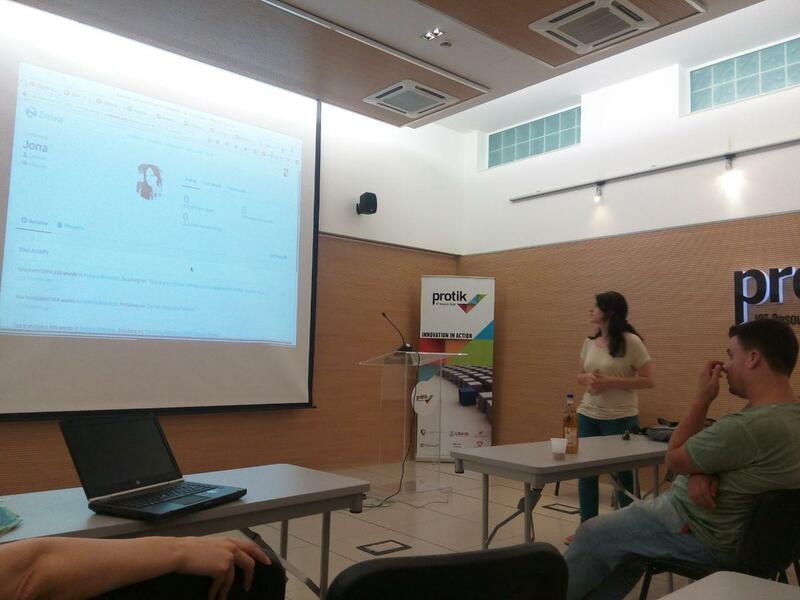 In order to do so, Viola presented to us some basic tips related to wiki markup language used to edit wiki pages. It is important to us that people in Fedora community get to know each other so we also showed how we can create a profile and gave some instruction for the Zanata platform where we can translate everything related to Fedora. Elio as a designer explained for our guests the hidden meanings of Fedoras Logo and invited them to contribute at Fedora design team. Need some help with Fedora? Ask a question at Ask Fedora, email other users on the mailing lists, or chat realtime in the IRC Channels. This was very important to talk with people who were present there, because they were worried if they will find “experts” who can help them with different technical problems, so I showed different mailing lists or IRC Channels that are used from Fedora community members and how we can get the best of them. I’m glad that people who participated in this event were very interested, they kept asking questions and get involved so I was not the only person who was talking all the time, instead we had a nice discussion and very helpful for our community building. As always we had lots of girls participating, and i must say nothing gets me happier than this! September 18, 2015 December 17, 2017 jonaazizajComments are off for this post.